These Christmas fixtures mark the halfway point of the season and things are hotting up nicely. Sloops entertained Polygon Legends and lost the first two frames but bounced back, winning the next five matches to go 5-2 in front. Back came the Polygon trio of Steve, Fred and Davey, winning the final three frames to force a well deserved draw. Phoenix, the league leaders, walloped an under-strength Bar 180A, 8-2. Hoping to keep up the challenge for the title, Legends A dropped two valuable points against Bar Tasca A. Graham and John won both their single matches to keep up their impressive form for the season, but losing both pairs matches didn’t help their cause for the title, drawing 5-5. Legends Jokers also lost ground on the leaders after failing to beat Toby Jug Saints, and they travel to Phoenix at the pool centre for the final game of 2014. A victory by The Jokers would close the gap going into the New Year. Summerland Elite lost further ground drawing 5-5 with Penalty Sharks. Wins for Clouseaus Diamonds at home to Target Old Timers 7-3, also Scruffys played their stable mates Scruffy Macs and lost the closely-fought contest 6-4 which leaves them at the bottom of the league. Also a great home win for Hoops against relegation threatened Dos Hermanos, eight frames to two. Grandee O'Donnell suffered their first defeat at home to Lupain Properties 6-4, but were very unlucky to lose two frames after potting the black and white ball at the same time. Lupain move up to sixth position in the league, the highest for them this season, and it was a great atmosphere at Grandee's. 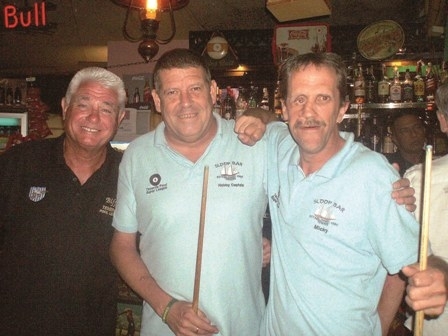 Bad Bobs travelled to Los Cristianos to play Target Rangers, defeating them 6-4. The on-form Dean Bull has an impressive singles record, winning 21 games and losing only three times during the first half of the season. Form like that makes him a certainty to play the Scotland team in the New Year. Britannia Inn (Paraiso) trounced Summerland Shooters 9-1 and remain in second position. Mad Hatters also won 9-1 at home to Palms Pool Bar. The draw specialists, Mykonos, played away at Nauta. Surprise! They drew 5-5. Bamboo Beach are sliding down the table after starting so well, with another draw against Bar 180C. Bar Leones bounced back to winning ways after losing their last game against Lupain, they recorded a 8-2 victory against Britannia Bar (Silencio). Lowly Lowrys were beaten at home by Barracuda Hunters 7-3. Wishing all players a great Christmas and a healthy New Year from your committee.